The Champions' Ballad DLC walkthrough continues with the four-part guide for the Mipha's Song questline. Since the Obliterator is no more, Link's health will refill to its normal level. As referenced in the above map, head to the monument that has risen up southeast of Zora's Domain. "One, find what the light's path shows. Two, conquer the ancient foes. Three, chase rings of the waterfall. Champion, the trials call!" Have a look at the maps on each obelisk. 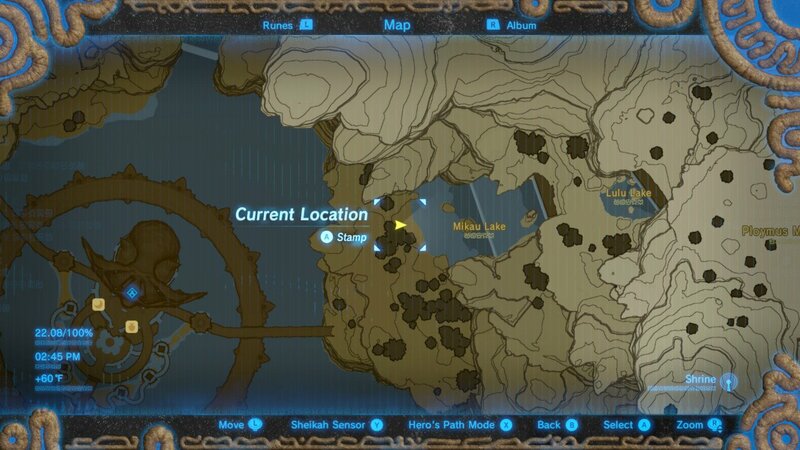 Equip the Zora armor, then set out for the first destination, just east of Zora's Domain at the base of Mikau Lake. Take a look at the blue ring floating in the water, then run straight through it. A challenge will begin where the player must swim through all of the blue rings in a given time. It isn't particularly difficult; just make sure Link has a full stamina bar before beginning, and hold the right joystick up after jumping out of waterfalls to make sure Link has enough momentum to glide through the floating blue rings. After completing the challenge, the Mah Eliya Shrine will emerge from the ground. Activate the terminal, then step inside. On the back wall of this shrine rests a series of obstacles that Link must climb up. Fortunately, conveniently-placed waterfalls make for good places to use the Cryonis power. 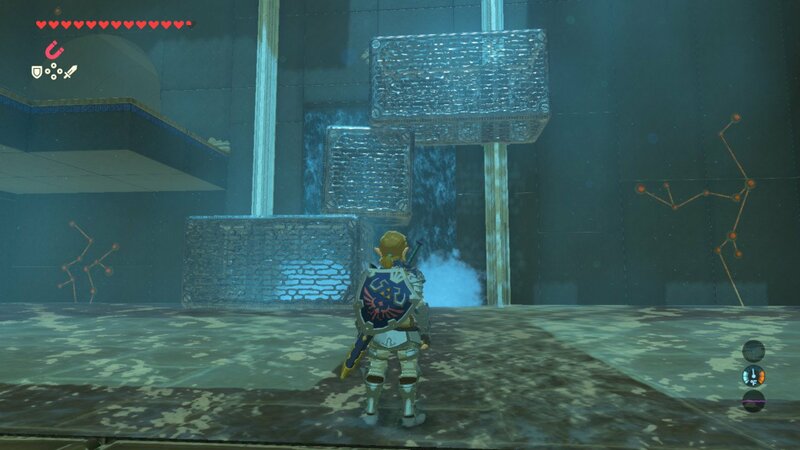 Climb up the first wall, then place a Cryonis platform in the lower-right and upper-left portion of the exposed waterfall. Climb both blocks, then jump down to the platform below and pull the climbable cube out of the alcove using Magnesis. The goal now is to build a structure that reaches up to the top doorway. Drop to the ground floor, then create an ice platform underneath the right climbable block. Once it's raised, put the climbable cube underneath it. Then grab the cube with Magnesis and raise the block up high enough to wedge the cube between the two blocks. After that, create an ice platform under the leftmost block to raise the entire structure up one level. If needed, slightly move the middle cube to the left to leave enough room to create another ice block on the waterfall. Remove the cube, then stack it once more on the rightmost climbable block to reach the doorway. 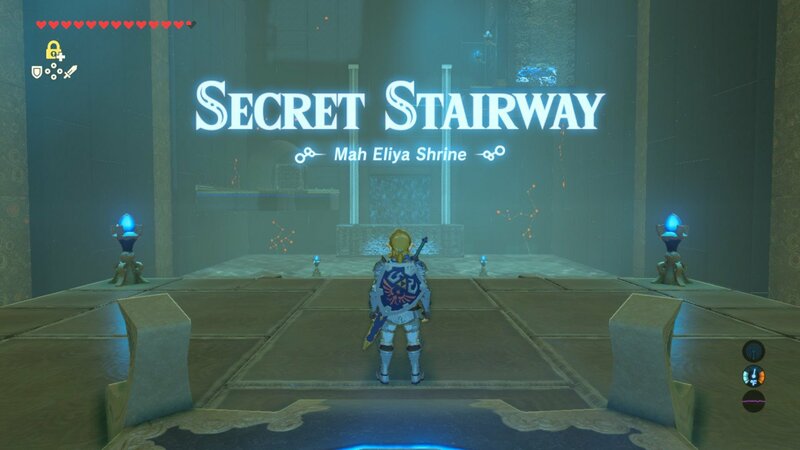 Climb the stairs, then speak to Mah Eliya to receive the first Ruta's Emblem. Head east from Zora's Domain over to Ulria Grotto, and from there head northeast toward Ankel Island. 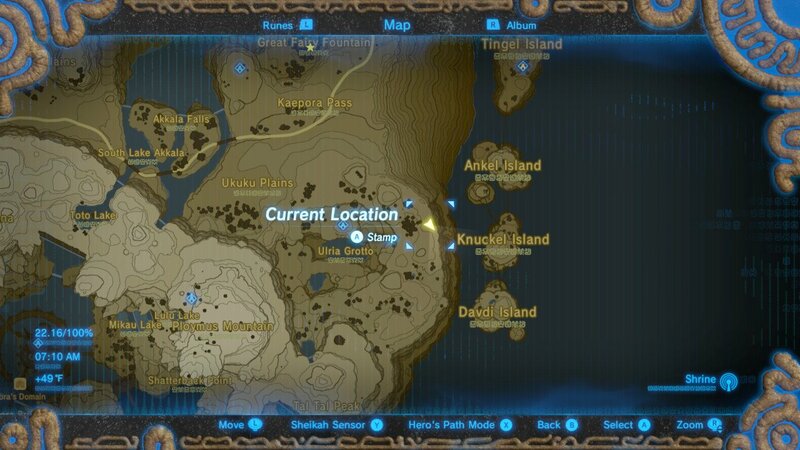 Around the furthest reaches of the eastern cliffisde, Link will spot a camp with two Zora known as Tottika and Muzu. Speak with Muzu, who will reveal the crucial first details of the next trial: "While the morning sun is newly born, follow the path of light to the trial." The clues point Link toward using the sun in the morning sky to point toward the entrance of the next shrine. Use the nearby campfire to sleep until morning, and a blue ring will appear in the water between Ankel and Knuckel Island. Glide toward it and swim through it to reveal the Kee Dafunia Shrine. Activate the terminal, then step inside. 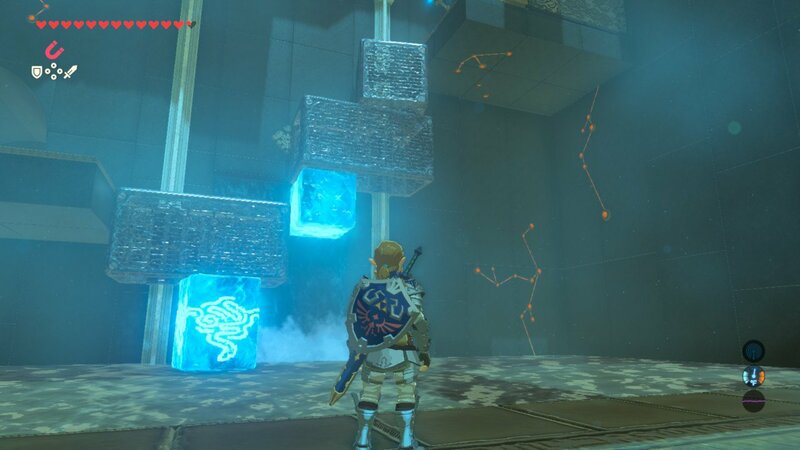 As might be assumed from the title, this shrine will involve Link using a torch to melt ice. Grab a torch by the entrance, light it, then head down the ice path to melt the two cubes blocking the passage. Beyond, a tall platform will be covered with ice blocks, with two nearby floor switches that summon more ice blocks. 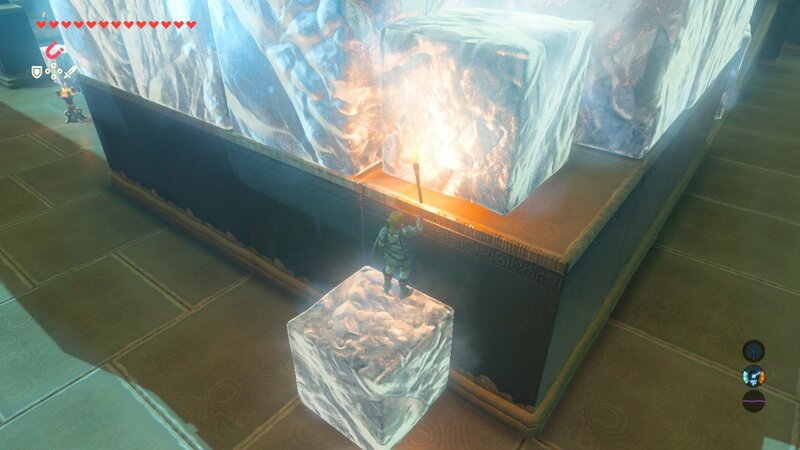 Use the switch to summon two ice blocks, then melt them just to the point where Link can jump on top of them. Jump on top of them and melt one of the cubes sitting on on top of the platform, then jump up to the platform. Continue melting your way around the platform until the upper area can be reached, then melt the giant ice cube in the center just to the point when it can be picked up. Carry it to toward the upper gate, then push it through. Afterward, place it by the far wall and summon a Cryonis platform underneath it. Climb up the platform and ice block, approach Kee Dafunia, and claim the second Ruta's Emblem. 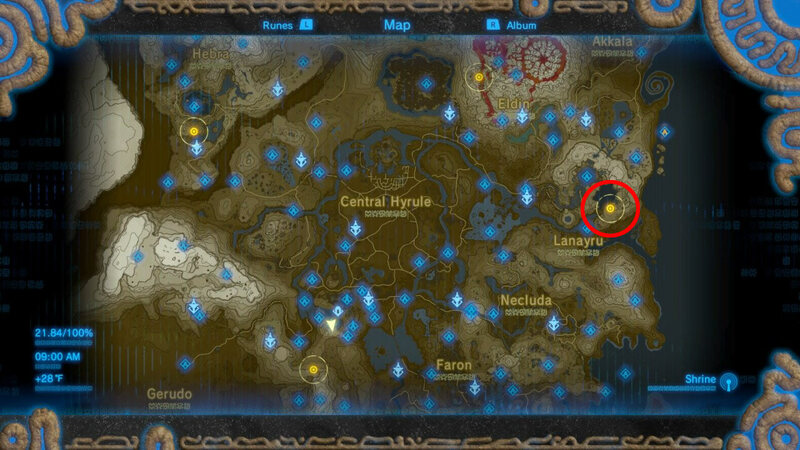 The third part of the EX Champion Mipha's Song questline takes place at Upland Zorana, just northwest of Zora's Domain. 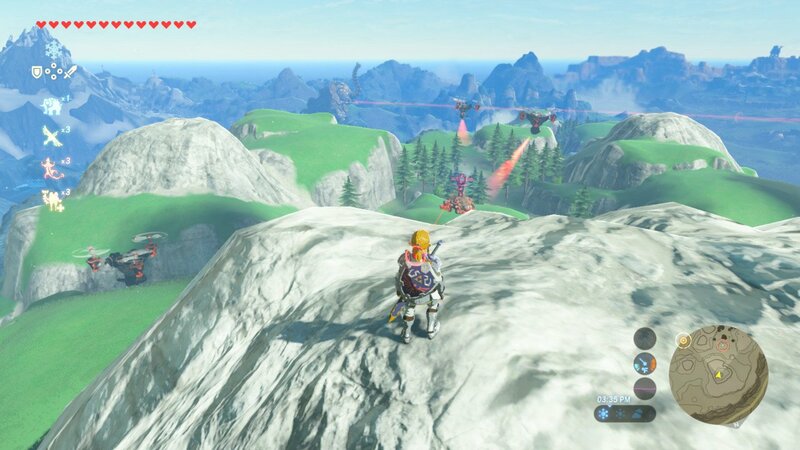 Swim up the waterfall north of Zora's Domain to Toto Lake or glide south from the Akkala Tower to wind up on the outskirts of Upland Zorana. From there, players will see three flying Ancient Guardians that must be dispatched, with one stationary Guardian covering the ground. The high road approach is not advised here — the central Guardian will have no problem spotting would-be Heroes on nearby ledges. Instead, stay behind cover and circle around the base of the mount beneath the Guardian. Climb up, use Statis on it, then nail it in the eye with an Ancient Arrow. After that, use the same trick on the flying Guardians. Once they're defeated, the Sato Koda Shrine will emerge in the distance. Run to it, activate the terminal, then head inside. The back wall of Sato Koda Shrine is covered by a giant contraption with running water as well as various tracks and rotating platforms. A sphere spawns from the upper-left corner, and players must create ice pillars to guide the sphere toward the funnel on the right side of the room. Before attempting to solve the puzzle, head down the path to the right where the power sphere funnel is. 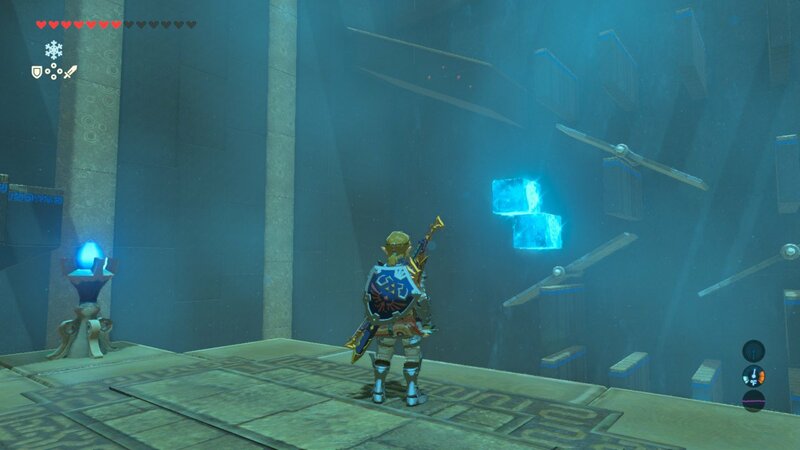 Create three ice pillars off the wall and climb them to reach the treasure chest, which contains a rare Giant Ancient Core. Head back to the main platform, then look at the area just beneath where the sphere falls. From the water behind it, create two ice blocks that will guide the ball onto the lower left lever. If done right, the ball will drop down, follow the ice, then roll down the lever straight into the launcher, which will propel it back up and into the funnel. Head down the stairs, then speak with monk Sato Koda to nab the third and final Ruta's Emblem. Once outside, start heading toward Divine Beast Ruta. When closeby, Link will hear a familiar disembodied voice call to him. Afterward, all three Ruta's Emblems will be taken away so that he may enter the Illusory Realm to take down the memory version of Waterblight Canon using only the weapons and equipment provided. 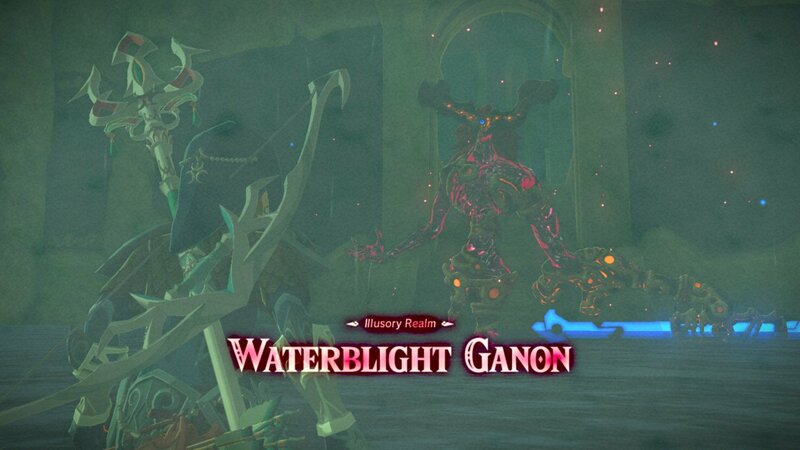 This version of Waterblight Ganon has the exact same offensive and defensive maneuvers as the one players faced earlier in the game. 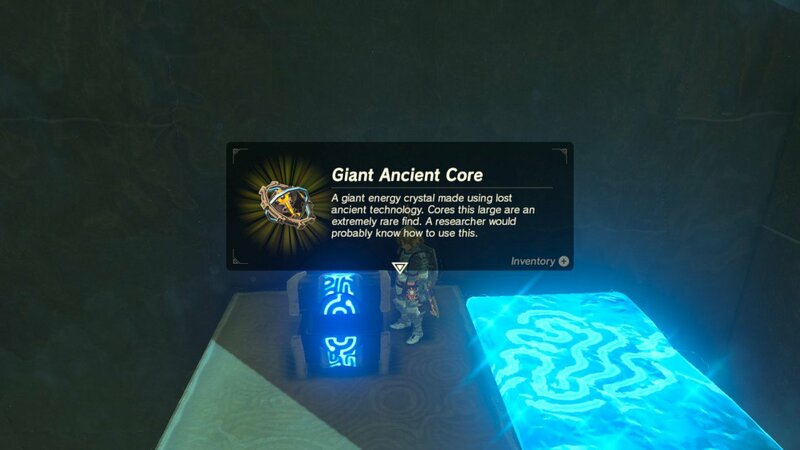 Use standard attacks or just one Urbosa's Fury to knock it down to half health, then use the Cryonis rune to destroy any ice cubes it might throw. When it comes in with a spear attack, repel it with Daruk's Protection to deal damage and stun the beast. Once it's back up, use Urbosa's Fury to get the kill. Watch as Waterblight Ganon wriggles into oblivion, speak with Kass to hear his new song celebrating the life of Champion Mipha, then enjoy the cutscene revealing more of Princess Mipha's past. 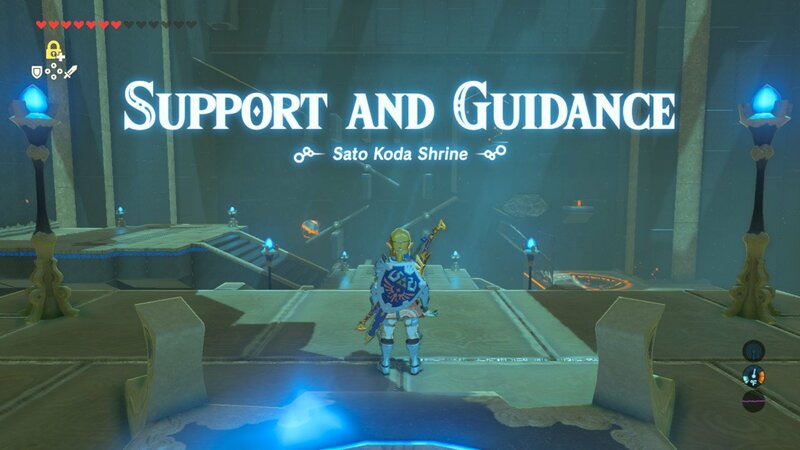 Afterward, Link will hear the voice of Mipha, who will reward him with Mipha's Grace +, which reduces the time required to recharge Link's restorative power. The challenges of The Champions' Ballad DLC aren't over just yet. For more crucial wakthroughs regarding the Breath of the Wild DLC pack 2, head on over to our complete Legend of Zelda: Breath of the Wild Champions' Ballad DLC walkthrough and guide.